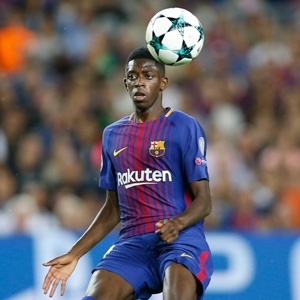 Barcelona - French striker Ousmane Dembele is close to shaking off a thigh strain and was named in Ernesto Valverde's Barcelona squad on Monday for the Champions League quarter-finals first-leg at Manchester United. The 21-year-old World Cup winner has excelled on both flanks this season after a slow bedding in process at Barcelona, but has been on the sidelines since March 16 with a thigh muscle problem. Valverde said he had chosen the still-struggling winger in his squad for Wednesday's game because he needed all hands on deck. "Dembele is on the list despite not yet being fully fit," said Valverde, who added that Dembele had taken part in full training on Monday. Dembele, who scored in Barcelona's 5-1 victory over Lyon in his last Champions League outing, had originally been expected to miss four weeks. The former Dortmund and Rennes forward missed Barca's 2-0 win at Atletico Madrid on Saturday as the club target a La Liga, Copa del Rey and Champions League treble they achieved in both 2009 and 2015.